I swore to myself this would be the year of the upgrade—that I would dance with the one who brung me and not buy any new bikes. In the nine years I've been back into bicycling, I've owned six bicycles. Four road bikes in a row, searching for my sweet spot. 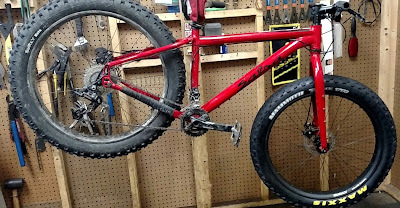 Then, after falling in love with unpaved surfaces on the Salsa Vaya, a dirt road touring bike, I "ended up with" a fat bike and a full-suspension 29er. The two earliest road bikes were sacrificed in horse trading... which leaves a bountiful four in my garage. That's a lot of scratch and a lot of metal and rubber. This year, I decided to stop the madness. If I wasn't having fun on a given bike, I would change it around until I did. If that didn't create excitement, I'd sell the bike. End of story. The first things to go were my beloved-but-threadbare Panaracer 28 millimeter Roll-y Polly tires on my Jamis Quest paved road bike. I replaced them with 28 mm Paselas (also Panaracers), a suprisingly high-quality budget tire with a little more flat protection and dirt road capability, and much the same terrific road feel. Nice bang for the buck, there. 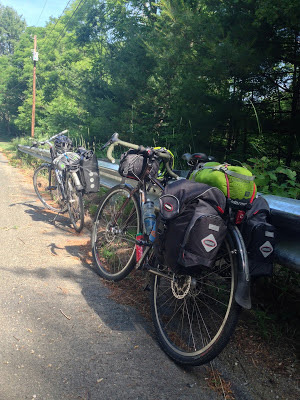 For my redoubtable Salsa Vaya, I wanted a set-up that would lead me back into road touring this year, so I purchased a set of well-built CarraDura panniers at a great price from the highly-touted Carradice company. I've already put these to great use on a solo bike overnight and my wife’s inaugural bike tour this spring. Tired as I was of carrying work shoes in my pannier when I used the Vaya to commute to the office, I bought a pair of classy VeloOrange Gran Cru platform pedals to replace the old Time mountain bike pedals. Even with the great price at Hampshire Bicycle Exchange, and the generous trade-in value on assorted parts I brought in, they are a relatively high-priced item, but if you'd felt how light they were and smoothly they spun on their overhaulable sealed bearings, you'd understand. 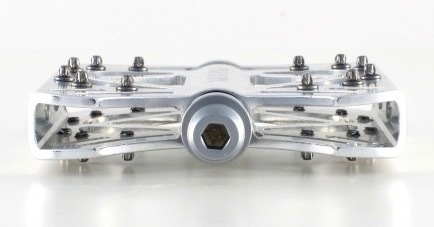 For the Pivot, the spec remains the same. However, given that I bought the bike used last year, and then spent nearly every ride of the season on it, I committed to the high cost of shock and suspension fork overhaul. The difference was noticeable, and hopefully extended the life of the parts, too. That bike still rides beautifully. That leaves only the Mukluk. The poor thing had been sitting in the basement for the better part of a year. Once I bought the Mach 429 (which weighs a nimble 27 pounds) the thought of struggling over hill and dale on on a 36-pound beast really turned me off. The warm winter with almost no snow was no help; I was out on it once. A week ago, I decided it was time to improve the ride or just sell the poor thing. 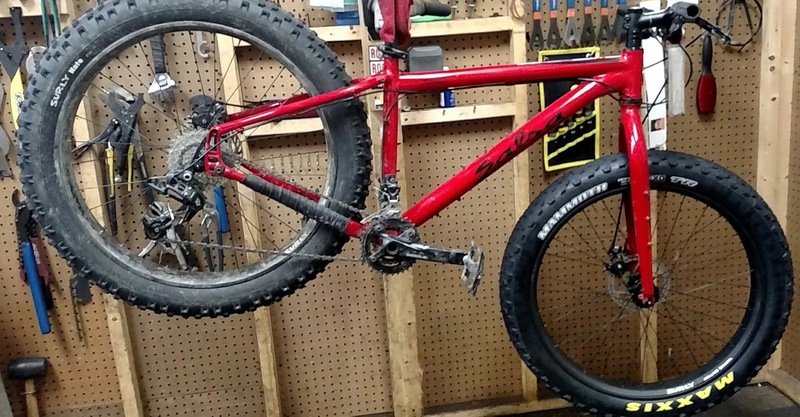 My shop is currently trying to mount a lightweight, three-season fat tire tubelessly to the beastly Rolling Darryl rims (the ones without the weight-saving holes...). If it works (an open question at the moment) I'll have saved three-and-a quarter pounds off the outermost part of the wheelset, which, in the bike world, is a boatload of weight. The lower profile tread and firmer rubber should also make most riding a lot more fun. 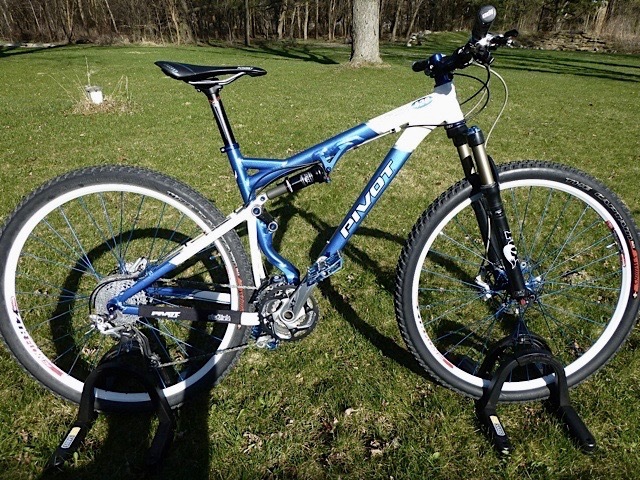 If that conversion does take, I'll then see how cheaply I can get hold of a carbon fat bike fork. This would chop about another full pound off the front end. Wow! Full confession: If I'm talking money spent on improving my riding experience, I can't leave out my new Five Ten Guide Tennies, bought to replace my worn-out Teva Cranks (now out of production, FYI). The Cranks were a great, lightweight shoe, but after a couple hours pounding around New England roots and rocks, my feet were just too tired, especially after the shoes started to wear out. I spent good money on the Tennies, but I’ve been ogling them for a couple years, and decided to pony up for a shoe that would work well for rides of any length, for tours (where one pair of shoes need to play multiple roles), and for day hikes—all while protecting my toes far better than the Cranks (which basically offered no toe protection). 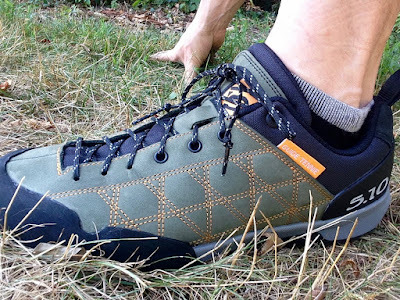 Been on a few rides with the Tennies so far, and they seem to be all that and more… and, for the win, ruggedly good looking, with contrasting stiching and a big climber's rand around the toe (great protection from rocks and branches on the trail). Again, more to follow in a full review. Minus the shoes, I’ve spent under $700 on making my four bikes much more exciting to ride. That’s a lot of money in one sense… but a fraction of what I’d have spent on a new bike, hoping to generate the same level of excitement. And this way, I'll ride all of them more. I think the tell-tale sign that my strategy is working was my perplexity last night over which steed I was going to ride to which type of adventure today. They all seemed equally alluring.